An AC tune up in Burlington, NC can keep your unit from freezing over. Ice on your air conditioner on a hot summer day? It hardly makes sense, but it’s actually quite common. If you experience this it can be confusing and you may wonder what to do. Taking the proper steps in this situation can make all the difference when it comes to the cost of repairs and the overall lifespan of your air conditioner. Chances are you are simply in need of a thorough AC tune-up in Burlington, NC. Turn off your AC. Any time your air conditioning isn’t working properly, the first step should be to turn it off. Whatever is going wrong will only continue to worsen as long as the system is running. This protects your air conditioner as well as your home and family. Check your filters. Extremely dirty or clogged filters can impede air flow into your HVAC system. Your air conditioner is supposed to take in warm air which blows over the evaporator coil. The evaporator coil contains refrigerant which absorbs the heat from the air and transfers it outside. The cooled air is then blown out through the vents in your home. When not enough hot air is blowing over the evaporator coil, it will get too cold and start to form ice. If your filters are dirty, replace them. Turn your AC back on and check air flow. If dirty filters were the problem, air flow through your vents should improve. You should feel a strong flow of cool air. If this is not the case, it may indicate a different problem. Turn your AC back off and call your HVAC service. Unless you have professional experience with HVAC systems, filters are the only maintenance item you should attend to yourself. If dirty filters are not the reason your system is frozen over, there is likely an internal problem such as a dirty evaporator coil or not enough refrigerant in the coil. Experts can clean the coil and the rest of your system as well as recharge the refrigerant level. Low refrigerant can be due to a leak which will need to be repaired. There are other possible causes of ice on your AC unit that your HVAC technician can diagnose and repair. If you see ice on your outdoor AC unit, don’t ignore it. Ice is a sign of a malfunction that will only get worse if left unattended. Having it repaired at the first sign of a problem can prevent further damage and costly repairs. It can also prevent full system failure and expensive system replacement. Continuing to run your frozen air conditioner will also waste a lot of energy, which will cause your bill to go up significantly. Want to avoid this entire unpleasant situation? Schedule regular yearly maintenance for your air conditioner to keep it running smoothly and efficiently. A thorough inspection and cleaning of your system will help you to avoid unexpected problems with your AC on hot summer days. Call Alamance Oil for an AC tune-up in Burlington, NC. (336) 273-8663. What is that Smell Coming from my Air Conditioner? 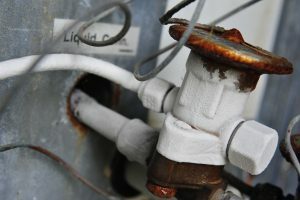 Why (and What) is My Air Conditioner Leaking?